Anyone who ever listened to The Police would know that Sting harboured ambitions beyond the limitations of one particular style. His former band may have come together during the punk and new wave heyday, but their pop nous and incorporation of reggae ensured that they stood out from their contemporaries. 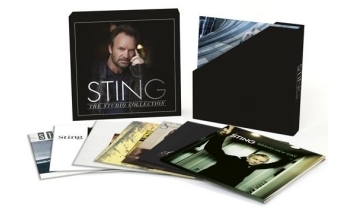 As the solo albums collected on the forthcoming 11LP box set Sting: The Studio Collection prove, when it came to carving out a solo career, Sting continued to ignore all notion of boundaries. Sting The Dream Of The Blue Turtles Album Cover - 300His debut solo album, 1985’s The Dream Of The Blue Turtles, established a unique sound that pushed the limits of what was expected of a pop song, as Sting enlisted jazz heavyweights such as saxophonist Branford Marsalis, later Rolling Stones bassist Darryl Jones and percussionist Omar Hakim. Centring around the theme of love, the album also included Eddy Grant on congas and was a Top 5 hit on both sides of the Atlantic. Sting Ten Summoner's Tales Album Cover - 300Through much of the 90s, Sting focused on his songcraft, releasing perhaps his most straightforwardly radio-friendly albums since The Police’s Synchronicity. Issued in 1993 and shooting to No.2 in both the US and UK, Ten Summoner’s Tales found Sting in total command of his skills, creating a perfect pop album (with no fewer than seven singles worldwide, among them ‘If I Ever Lose My Faith In You’) that shot to No.2 in both the US and UK. Its follow-up, 1996’s Mercury Falling, continued in the same vein, as Sting warded off both grunge and Britpop, emerging as a mature songwriter working at the peak of his powers. Sting Brand New Day Album Cover - 300Entering the new millennium, Sting had little to prove. Brand New Day ended the 90s with an album that brought the likes of Stevie Wonder, BJ Cole and regular sideman Branford Marsalis on board for a work which merged everything that had come before: world music, jazz and Sting’s natural pop inclinations. With strains of electronica creeping in, it proved that he’d lost none of the ambition of yore, and now had the skills to merge that with his finely crafted pop skills. With unwavering confidence, Sting pushed on into the 21st Century with 2003’s Sacred Love. An album that fully incorporated the electronic strains of its predecessor, it also saw him working with a wide array of collaborators, among them R&B star Mary J Blige, flamenco guitarist Vincente Amigo, and sitar player Anoushka Shankar. His last studio album for 10 years, Sacred Love sat comfortably at No.3 in both the UK and US, proving that, four decades into his career, Sting’s ability to create wide-ranging, forward-thinking pop music hadn’t dimmed.